I remember way back in the Epic A playtesting days, when pics of this guy painted were first released, it was generally disliked. I remember thinking the gun coming out of the head was terrible, and the hoves were universaly hated by everyone. Jervis said that he had the (noobie) Epic sculpter model the mold after some picture John Blanche had done (which I havent seen - so if anyone has a link to it let me know). Anyway, I rejected the notion of getting this then, especially since I have a few AT/SM1 Warhounds from back in the day, and the Forgeworld version which I still think is awesome. After GW killed off the Epic A line, I realized there were a bunch of minis I would have like to have gotten (like the Steam Gargant). So I kept my eye out on Ebay for this guy, and managed to recently one for around $32. Don't remember what GW sold it for. Anyway, as soon as I got it out of the package I was impressed with the detail. In that regard its pretty well done. But the weapons are kind of danty, and once it is all put together is kind of looks fagile. Alongside the others (I wants to post a picture of it alongside the others but forgot) it almost looks out of place. I like Warhounds, even the silly wolf head of the original, but to be honest if this version was the first ever made I am sure it would have slipped into obscurity before SM2/TL was released. It doesnt even seem to have the same feel or look as other miniatures from the line. Almost like it was taken from a different gaming company as a proxy. I do have some appreciation for the guy, but to be honest are surprised this was even made. I am thinking it would have been better off recycling the old SM2/TL version, as I can't see very many of these selling. And the painting scheme that was shown on the site really masks all of the detail that it has, but when you see it in person, it just looks too fragile. Nevertheless, I like it, plan on painting it up, and playing it when I can, but I dont recommend shelling out a lot for it. I am ok with paying what I did. For some reason Warhounds have been pretty pricey on Ebay lately, even for the early version. Don't know why. I give this baby 2 out of 5 stars (with the first version taking in 3 stars and the forgeworld taking 5 out of 5). WHO PUTS AN HONOUR BADGE ON A FOOT???? I have a bit of a soft spot for this one, the with the caveat that i've yet to build and/or paint one, so i might still end up hating it. The shape of the hull works for me. I'm not so sure on the details, as it feels a bit 'busy'. The plasma gun is awful, but the VMB is good i think, especially if you extend the barrels. Planning to use two in my AMTL. It is the only version of the Warhound, or in fact of ANY Imperial Titan, that I dislike. I would go so far as to say I HATE this model. I still remember fondly when the original Warhound was newly released. Apart from it's relative lack of poseability, I stillthink the original model holds up really well. Lot of affection for it- it just conveyed the aggressive animalistic nature. And the Forgeworld Warhound is a thing of beauty- quite possibly my favourite Titan model. I have four painted and twice thatin reserve for when the painting bug strikes again. 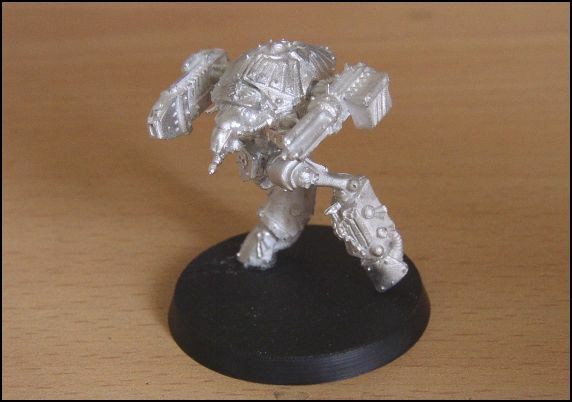 The above monstrosity does n't hold a candle to either the original or Forgeworld Warhound. The weapon sculpts are poor, and that's without considering that there was only 2 weapon types rather than the 4. I have one in the depths of my Epic figure case and I can't imagaine it seeing the light anytime soon. The other Titans would make fun of it!! This Warhound is hideous. I never had any desire to buy one. It ranks up there in awfulness with the E40k Eldar Titans. ... watches the tumbleweed roll past...! As usual FW did it better (most the time)! Yes, it was, and still is, awful. I don't think that any of the later Imperial titans looked that great, but this was undoubtedly the worst. The original Warhound remains the best in my opinion, because of its simple design, and, for an Imperial titan, elegant shape. As always, I remain willing to take surplus examples of these unloved creatures off people's hands. That's news to me, too. Well, it is big. Sub-par is perhaps a bit provocative. But it is a tad silly looking. There. I said it.